"Girls have always been able to play out different roles and careers with Barbie and we are thrilled to shine a light on real-life role models to remind them that they can be anything"
Barbie has a new dream job — actually, a lot of them. 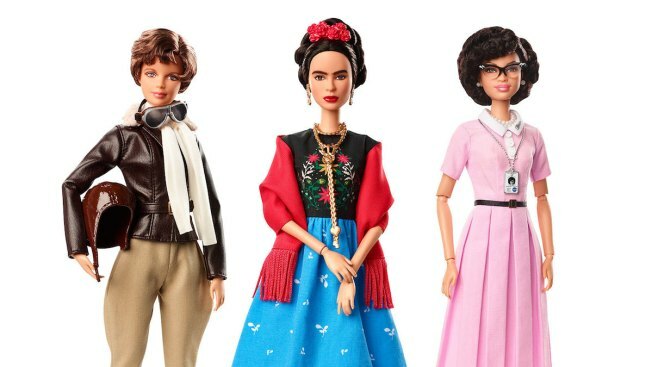 The legendary doll brand just announced a new “Inspiring Women” Barbie collection that honors three historic figures who each made a major mark on the world, "Today" reported. Featuring Amelia Earhart, Frida Kahlo and Katherine Johnson, the new collection comes just in time for International Women’s Day on March 8. Each doll includes information about the contributions each woman made to society and her respective field. In a press release, Barbie's senior vice president and general manager, Lisa McKnight, said she's excited to launch this latest group of inspirational dolls: "Girls have always been able to play out different roles and careers with Barbie and we are thrilled to shine a light on real-life role models to remind them that they can be anything."